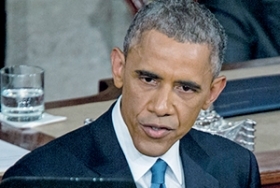 Obama: Deals are vital to economic plan. 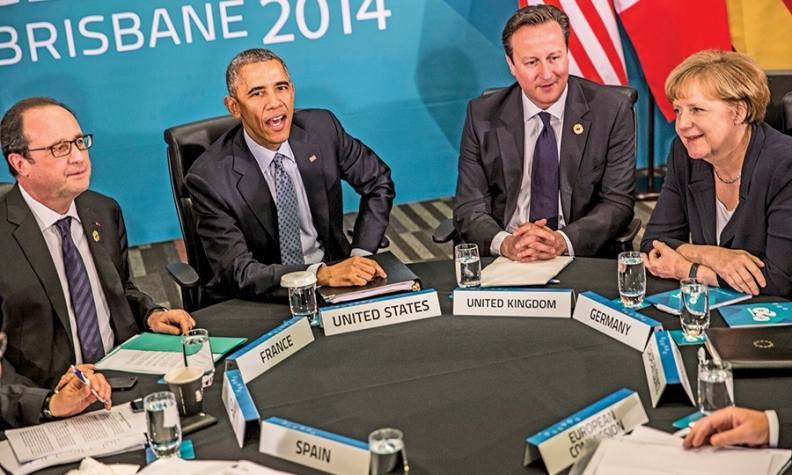 President Obama, left, speaks as U.K. Prime Minister David Cameron and German Chancellor Angela Merkel listen during a Transatlantic Trade and Investment Partnership meeting during the Group of 20 summit in November in Australia. The next round of talks is to begin today in Brussels. WASHINGTON -- In his State of the Union address last month, President Obama asked Congress to grant his administration wide power to negotiate free-trade deals without too much meddling from lawmakers. For the auto industry's stakeholders, it was like a boxing bell signaling the next round in a high-stakes global fight. From Tokyo to Berlin to Washington, partisans on international trade have been staking out their positions in an effort to frame the debate to their advantage. Ford lobbyists are sounding alarms about currency manipulation as a protectionist tool. German automakers are denouncing the costs of tariffs and regulatory disparities. And in Japan, media reports are floating the notion that auto import barriers aren't the big stumbling block that they're made out to be. The Obama administration is working on two fronts: the Transatlantic Trade and Investment Partnership with the European Union and the Trans-Pacific Partnership with countries around the Pacific Rim. Together, the two blockbuster free-trade deals form a critical piece of Obama's economic agenda, with major implications for automakers. Among the issues on the table are the elimination of tariffs that add thousands of dollars to the price of foreign-made cars and trucks; and in the EU-U.S. talks, mutual recognition of safety and emissions regulations from both sides of the Atlantic, which would sharply reduce vehicle development costs and make it more economical to sell vehicles globally. Meanwhile, negotiators are working on a side deal to the Trans-Pacific Partnership that would seek to ease rules that, critics say, effectively limit Japan's imports of U.S. autos. The coming debate in Congress will be over whether to give the president Trade Promotion Authority, the so-called fast-track power that would allow the administration to negotiate the trade deals and bring them to Congress for an up-or-down vote, without amendments. With both chambers of Congress now in the hands of the pro-business Republican Party, the treaties would appear to have more momentum. But that momentum won't go unchecked. Ford Motor Co., long a vocal automaker in Washington on trade issues, took out an ad in Politico on Jan. 22 that used the global sales launch of the redesigned Mustang as a platform to call for rules prohibiting currency manipulation in free-trade deals, a veiled snipe at Japan, which Ford executives say has artificially depressed its currency to strengthen its exporters. Ziad Ojakli, Ford group vice president of government and public affairs, underlined that message in a speech delivered the same day at the Washington Auto Show, declaring that "the 21st-century trade barrier is currency manipulation." Ford's proclamations came after the American Automotive Policy Council, a lobbying group funded by Ford, General Motors and FCA specializing in trade, reported $150,600 in lobbying expenditures in the fourth quarter, the most spent by the group in a single quarter since at least 2010, according to federal lobbying disclosures. Across the Atlantic, a cadre of top German auto execs held a press event in Berlin on Wednesday to pledge their support for the Transatlantic Trade and Investment Partnership ahead of an eighth round of talks that begins today, Feb. 2, in Brussels. BMW CEO Norbert Reithofer said that the German auto industry pays more than 1 billion euros per year in tariffs that could be used to invest in new technologies, while Daimler AG CEO Dieter Zetsche called for the EU and U.S. regulatory agencies to recognize each other's standards. The executives said the Transatlantic Trade and Investment Partnership pact would unlock some 5 billion euros in cost savings by harmonizing technical standards and regulations. The push was a move to rally support for the deal, which is running into pushback from European labor unions. "We will not accept a softening of standards for environmental and consumer protection or a hollowing out of worker rights and the right to co-determination," the head of German trade union IG Metall said in a joint press release also signed by the German union representatives of Daimler, BMW, Ford, Opel and Volkswagen's VW, Porsche and Audi divisions. The Trans-Pacific Partnership, on the other hand, is further along, with U.S. Trade Representative Michael Froman signaling to Congress last week that the pact could be wrapped up in months. But Froman also found himself having to counter some posturing from Japan that came in the form of a report in the Nikkei business newspaper. Citing unidentified sources, the Nikkei reported that the U.S. trade negotiators had dropped a push for Japan to ease auto regulations that critics say have effectively closed the Japanese car market to U.S. vehicle exports, apparently in exchange for Japan agreeing to accept greater U.S. rice exports. Not so, Froman told a Senate Finance Committee hearing, at which Sen. Debbie Stabenow, D-Mich., also pressed the case against currency manipulation on behalf of her state's auto industry. "One thing that I've learned in this job is to not believe everything you read in the press," Froman told Stabenow. "And particularly the Japanese press."